Looking for ‘The One’ online can be a bit like looking for a needle in a haystack. And I speak from experience when I tell you to expect the unexpected on those nerve-wracking first dates. Will he turn up at all? Will he turn out to be a couple of inches shorter than stated in the profile? Does he have personal hygiene issues? Is he older than declared? Is he out to get a leg over while the missus watches the kids at home even though he stated he was single on the profile? Internet Dating site are shark infested waters and you need to have your wits about you. Good news is… the cards can help! I have created an Internet Dating Vetting Spread to help you discern their true intentions. Shows you why this person is dating. It can show if they are ready for a new relationship and if their intentions are honourable. Shows why the other person feels drawn to you based on your dating website profile. Shows the spiritual reason for why you are attracted through the ether, or what you could learn from this. It might also show if there is a karmic/past life link with this person. Look out for the 6 of Cups or Majors in this position as a clue to whether or not you have a past life connection, and what the nature of your connection was. Shows possible hopes or fears the other person might have concerning the date. This card shows you what to be mindful of and/or what the best approach would be on the date. 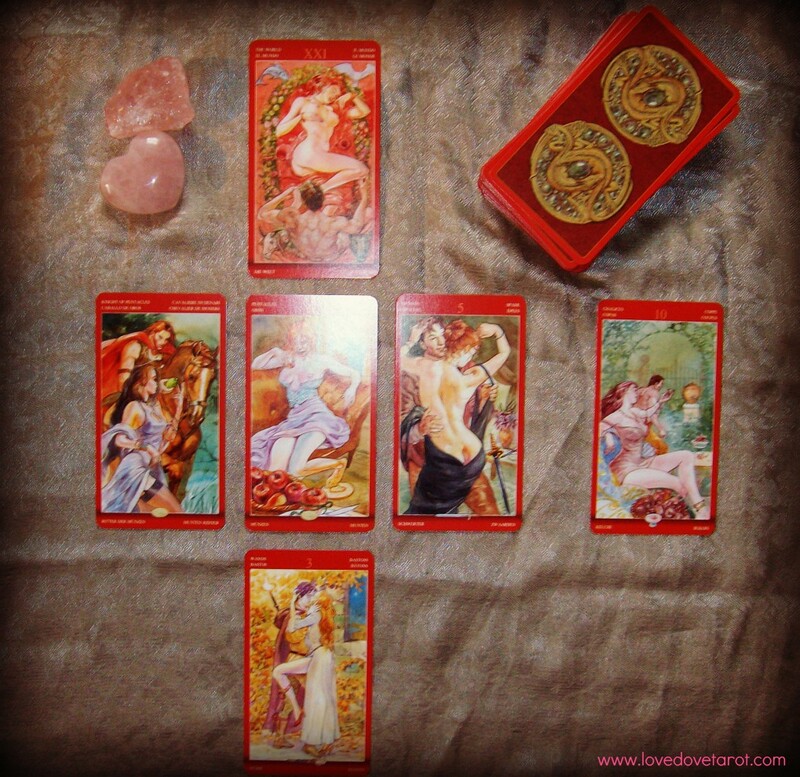 The 6 of Pentacles here shows me that he is looking for fairness in a relationship. Essentially he sees himself as a good guy who has been treated unfairly in the past. The Knight of Pentacles here shows me that it’s purely raw physical attraction. He found my picture, liked it and sent a message. There may or may not be spark in real life – only going there will tell. This card shows me that he is not really concerned with the intellectual, emotional or spiritual connection. It doesn’t mean that they won’t be there at all – they’re just not his primary concern. A small but highly visible red flag has appeared in my mind. Indicates how the date will turn out. Uh oh. The 5 of Swords here is not a good sign. Should I or shouldn’t I? Definitely not having any expectations whatsoever after seeing this card. One indication could be that we both spend all night talking about our ex’s as the 5 of Swords deals with cutting losses. Then again, a bit of talk therapy might just be what the doctored ordered in spite of how it’s considered bad dating etiquette to bring up your ex. So what if there is no second date, right? Shows the spiritual reason for why you are attracted through the ether, or what you could learn from this. With The World in this position, I feel that it might be worth going in spite of the 5 of Swords signifying the actual date. It might be a step in the right direction of finally firmly shutting the door to the past and bringing new energy in. He’s definitely hoping for a good night kiss at the very least with the 3 of Wands here. He’s also hoping for a good time in general and I suspect he’s pretty good at making lemonade out of life’s lemons. The 10 of Cups here could be a heads up to be mindful of personal boundaries as the Mars in Pisces energy of this card is pretty good at merging mindlessly with others. On the other hand it could also mean that it is OK to keep my heart open and show compassion while being mindful of my personal boundaries as Pisces is all about compassion and helping others. It may not be about what I can get out of it but what I’m prepared to give from a spiritual perspective.